How to watch The 100: Season 5 (2017) on Netflix Austria! Sorry, The 100: Season 5 is not available on Austrian Netflix, but you can unlock it right now in Austria and start watching! With a few simple steps you can change your Netflix region to a country like USA and start watching American Netflix, which includes The 100: Season 5. We'll keep checking Netflix Austria for The 100: Season 5, and this page will be updated with any changes. The 100: Season 5 is not available in Austria BUT it can be unlocked and viewed! 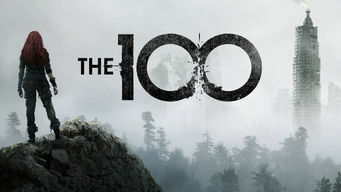 Season 1 of The 100 has 13 episodes. Because different Netflix countries have different availability for episodes, you'll need to check the episode listing below to see which are available in Austria. Having discovered that Jasper may still be alive, Clarke, Bellamy, Octavia, Finn and Monty set out on a mission to locate their friend. A fast-moving, toxic fog jeopardizes a mission to find a substance that could save Jasper's life. Clarke learns the truth about her father's betrayal. After a shocking death, Clarke and Finn grow closer. Bellamy must keep the group from turning on one another and Abby takes a huge risk. After exposing Kane’s plan to reduce the population of the Ark, Abby and Jaha realize at least some of the 100 must still be alive. 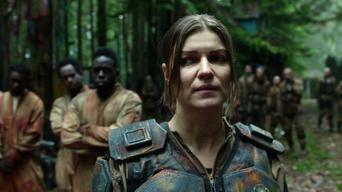 Bellamy and his crew run into Grounder territory as they search for Octavia while Raven notices the deep connection between Finn and Clarke. Abby guides Clarke through a dangerous procedure while Diana Sydney takes her place as Chancellor. Kane agonizes over his recent decision. Some of the 100 lose touch with reality after eating a hallucinogen. One of them is tasked to kill, and Diana Sydney's treachery is revealed. Clarke and Finn attempt to broker peace with the Grounders while others prepare for battle. Meanwhile, tragedy strikes the Unity Day celebration. 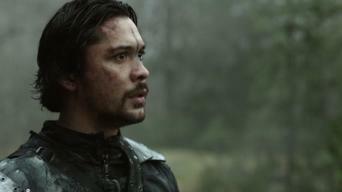 John Murphy returns claiming to have been held captive by the Grounders and Clarke and Bellamy have different ideas on how to handle his return. As the conflict escalates, Clarke pleads with Bellamy to do the right thing. Octavia makes a difficult choice. Raven and Jasper work against time. Season 2 of The 100 has 16 episodes. Because different Netflix countries have different availability for episodes, you'll need to check the episode listing below to see which are available in Austria. Trapped in the white room, Clarke tries to make sense of her surroundings. The Ark survivors face moral and physical dilemmas. An old enemy returns. A suspicious Clarke confronts President Dante Wallace and demands answers. Kane interrogates one of the 100, and Abby performs emergency surgery. Clarke teams with an unlikely ally after making a horrific discovery about Mount Weather's medical ward. Abby confesses to a crime. Kane leads a mission to make peace with the Grounders, Jasper participates in a risky experiment and President Dante Wallace issues a warning. Raven learns that Mount Weather is causing communication interference, tempers flare between Clarke and Finn, and traitors surround President Wallace. Abby prepares a leap of faith to save her people from a Grounder assault. Meanwhile, Bellamy and Octavia share a shocking secret with Clarke. A riot breaks out over Finn's actions as Abby and others decide whether to put him on trial or turn him over to the Grounders for torture. Clarke strikes a deal with Lexa and Indra while the newly formed alliance between the Sky People and the Grounders is threatened. Clarke and Lexa encounter a new enemy, Bellamy and Lincoln work together to break into Mount Weather and Indra makes Octavia an appealing offer. Bellamy and Lincoln's actions have brutal consequences, Abby fights to stay in control and a desperate Jasper confronts President Wallace. Tensions between Clarke and Abby come to a head, Raven helps Bellamy navigate Mount Weather and Jaha and Murphy encounter a stranger. Clarke questions Lexa's leadership decisions, Abby struggles to help an injured Kane while Jasper steps into a leadership role. Desperate for help, Raven summons Wick. Jaha and Murphy encounter a perilous roadblock, and Bellamy is in a race against time at Mount Weather. 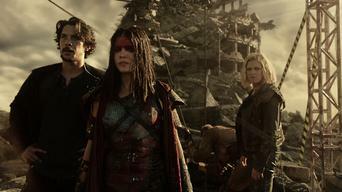 Clarke and Lexa prepare for battle, while Raven and Wick experience a major setback. Meanwhile, Octavia and Lincoln must make a difficult decision. The journey to the City of Light continues as Jaha makes a move that shocks Murphy, Clarke receives unexpected help and Lincoln gets his revenge. Season 3 of The 100 has 16 episodes. Because different Netflix countries have different availability for episodes, you'll need to check the episode listing below to see which are available in Austria. Bellamy and Kane head out on a mission to save Clarke, who has a bounty on her head. Murphy encounters Jaha at the mansion. Bellamy and Kane risk their lives to rescue Clarke. Abby considers opening Mount Weather as a medical facility. Murphy plans a betrayal. Clarke wrestles with a difficult decision. Meanwhile, Bellamy learns that something isn't what it seems. Clarke uncovers the architect of a clever plot. While Kane tries to maintain peace, Jasper spirals out of control. As Pike tightens his grip, Clarke races to stop a brewing war and a familiar face returns to Arkadia with a new mission. Murphy plays a risky game. Clarke must decide between exacting revenge and making peace. Octavia and Kane team up, and Abby is concerned about Raven. Clarke makes a discovery that changes everything. Lexa attempts to maintain stability among the clans. A dark chapter from the past is revealed. 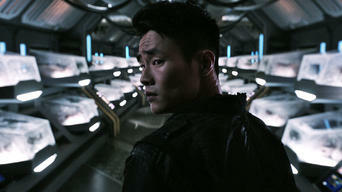 As Kane tries to find a peaceful solution, he comes to realize that he might have to take a more drastic course. Raven wants Jasper's help. 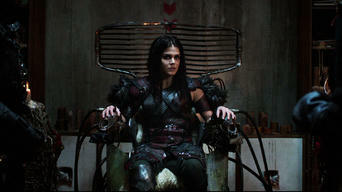 While Clarke makes an alarming discovery, Octavia faces a decision that could have dire consequences. Abby and Kane share a moment. Jaha takes a frightening new approach in his efforts to recruit Abby. 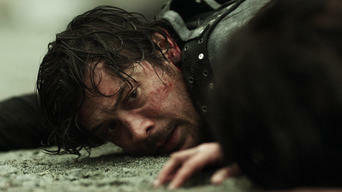 Bellamy faces a difficult truth, and Monty lands in a dangerous situation. While Jasper's rage grows, Raven's dark side emerges under the influence of ALIE. Octavia tries to figure out her place in the world. Clarke embarks on a mission that could change everything. Murphy gains insight that may be the key to his survival, and Kane reaches his limit. In Part 1 of the two-part season finale, Clarke finds hope in the most unlikely place. Meanwhile, ALIE's master plan comes together. Season 4 of The 100 has 13 episodes. Because different Netflix countries have different availability for episodes, you'll need to check the episode listing below to see which are available in Austria. Trapped in Polis and surrounded by hostile Azgeda, Clarke devises a risky plan. Meanwhile, Raven discovers the grave new threat facing them all. Roan takes a risky stand to buy time for Skaikru's secret work, and Bellamy and Clarke face tough choices that imperil the survival of them all. With the radiation closing in, Jaha leads Clarke and Bellamy on a long-odds mission to find a refuge. Roan sends Octavia to retrieve the stolen Flame. Clarke's lies foment a revolt, Abby leads a risky quest to find Nightblood, and Octavia faces a showdown when the clans' alliance disintegrates. With the alliance broken, Roan and his Azgeda army march on Skaikru's base, forcing Clarke into a desperate gamble to avoid an all-out war. Clarke and Roan lead a dangerous sortie to deliver precious fuel for Raven's Nightblood mission, and Octavia faces her consuming thirst for revenge. As lethal black rain falls, Abby seeks a last-ditch radiation cure, Octavia connects with Ilian, and Bellamy faces a life-or-death decision. As time grows short, Clarke takes drastic action to find a cure. Looking for a secret bunker, Kane and Jaha face a doomsday cult's cryptic riddle. Betrayal and bad blood drive the clans toward a deadly showdown, Octavia struggles to renounce her violent past, and Raven chooses her fate. Octavia, Roan and warriors from every clan fight to the death in a ritual battle for control of the bunker -- but not everyone plays by the rules. Octavia stalls the clans for time while Bellamy defies Clarke's plan for the bunker. Monty tries to save Jasper. Raven discovers unexpected hope. 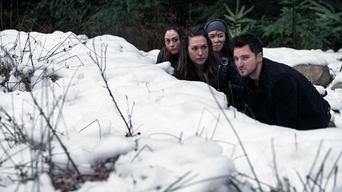 Clarke and Bellamy lead a perilous mission to rescue Raven. 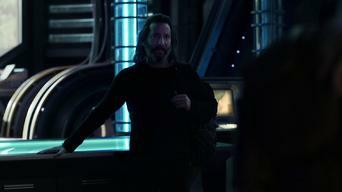 Kane and Jaha clash over selecting survivors. Abby makes a fateful decision. As Praimfaya strikes, Octavia assumes command of the bunker, and Raven leads Clarke's stranded team on a last-minute race to escape destruction. Season 5 of The 100 has 13 episodes. Because different Netflix countries have different availability for episodes, you'll need to check the episode listing below to see which are available in Austria. Struggling to survive alone in a world scorched by Praimfaya, Clarke makes a startling discovery -- and faces a dangerous new threat. Octavia spills blood to establish her command when overcrowded conditions and violent clan tensions turn the bunker into an underground war zone. Diyoza's invaders go on the hunt to take over the valley from Clarke. Raven's crew makes an alarming discovery aboard the orbiting mystery ship. A tenuous pact teeters on collapse during a mission to liberate the bunker. Raven and Murphy face a dire choice aboard the Eligius IV. While a rift among her soldiers widens, Diyoza puts Abby to the test. 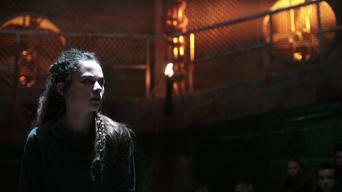 Octavia clashes with Clarke, who discovers a gruesome new threat. A surprise overture from Diyoza puts Octavia's ironfisted leadership to the test. Clarke turns to an unexpected ally for help protecting Madi. 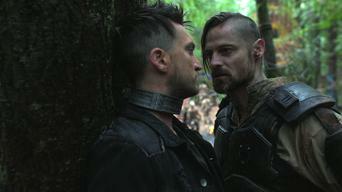 Clarke turns to Indra after discovering Octavia's barbaric plan to conquer the valley. Echo forces Raven's hand to initiate Monty's cyberattack. While Octavia finalizes her battle plans, Clarke makes a treacherous play to prevent war. Abby pleads for Raven's help after making a breakthrough. Murphy lights a fire that sparks calamitous events in Shallow Valley. The widening schisms forming in Wonkru worsen and may become permanent. Clarke races to keep Madi safe while Octavia forces Bellamy, Indra and Gaia into a violent showdown. Abby fights a desperate personal battle. Clarke scrambles to save Abby, who reveals a ghastly secret from the bunker. The converging armies prepare for a climactic battle for Shallow Valley. As battle erupts, a betrayal leads to catastrophe. Madi defies Clarke over the fate of Wonkru. Octavia faces the consequences of her recklessness. After the disaster in the gorge, Wonkru unites under Madi for a final assault while McCreary's lunatic plan leads to a fate-changing revelation.